Hiring Spanish, French and Mandarin Teachers in Chicago! 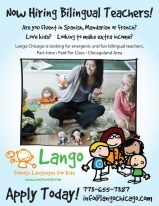 Lango, a foreign-language program, is seeking teachers for its Spanish and Mandarin classes for young children (ages 1-10), to be taught at various locations around the Chicago Area. Experience in a preschool setting, or early childhood coursework preferred. This is an excellent opportunity for parents, retired teachers and students studying education and looking for a PART-TIME position. Teachers must be energetic, high energy, outgoing and eager to engage children through fast-paced dynamic and interactive games, movement and music-based classes. A high level of comfort with dramatic play, puppets and physical activities is a must for this job. We are willing to train the right person but if you have not done this type of work, make sure will really enjoy it before you contact us. These are extremely fun classes but they require that you be flexible and open to new and creative approaches to teaching young children! Fluency in the target language – teachers must be native speakers or fully fluent with no discernible accent. Incredibly energetic and dramatic; an outgoing personality, high level of enthusiasm, self-confidence are a must for this position! Good Communication Skills, comfortable talking with parents about their children’s progress.